More UK Deaf children are attending mainstream school because of specialist Deaf school closures. Children with hearing difficulties can often feel very isolated at school and the learning experience at times may be more difficult for them. Depending on their degree of hearing loss, children may have a communication support worker (CSW) to work with them in class. Additional simple measures can be put in place can help deaf children learn and thrive at school. Staff can attend a Deaf awareness training course. Ideally at least one teacher in every school will learn BSL at least to level 1. The latest figures available from the UK Statistics & Facts United Kingdom (2017), 1 in 7 of the UK population (9 million) has mild to profound deafness. Around 1 in every 1000 child born in the UK has a profound or severe hearing loss – 90% of all deaf children have hearing parents. By schools and other educational establishments putting in place these 5 simple steps, it could make all the difference for a deaf child and their learning needs. Read about the difference between Makaton and British Sign Language in our Frequently Asked Questions section. At Dot Sign Language, we’ve seen first hand how Deaf children with the right support can develop their full potential. We’re specialists in the education sector from school age right through to university level. We teach at the Royal Surrey Grammar School (Guildford), St Andrew’s Catholic School (Leatherhead), The University of Surrey and many more. We can also give a half hour assembly – as part of our deaf awareness teacher packages where we teach based finger spelling. 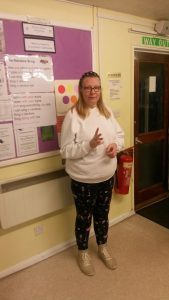 We have a Deaf teacher or ‘Deaf role model’ who explains what it is like being deaf, growing up being deaf, what school was like for them; and can then answer any questions from the pupils. We will teach some basic signs e.g. everyday greetings, school signs, and give the children a fingerspelling sheet which they can take home and learn to spell their names from. Children tend not to be as inhibited as adults and often come up with brilliant questions! Based in Woking, Surrey, we’re able to visit schools and other educational establishments across London and the South East. “The assembly with Dot Sign Language was great and our children really enjoyed learning the signs for the colours and members of their family. Highly informative and recommended,” Serena Roberts Headteacher, St Mary’s Cof E Infant School, Godalming. As a not-for-profit organisation we don not charge for these assemblies, but we do ask for a donation to cover expenses for time and travelling.